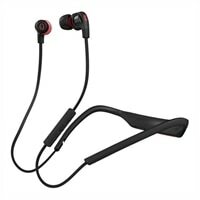 Skullcandy Smokin Buds 2 Earphones with mic in-ear wireless Bluetooth - black, redLet's face it: whether they look like Spock's or Will Smith's, ears are weird but completely necessary. Fortunately for you, the Smokin Bud 2 is unbiased. Aided by an off-axis (angled) design and oval-shaped port tested and researched to be perfect, Smokin Bud 2 has been cultivated for superior fit, comfort and acoustic performance. Skate with buds, go running, go skiing, whatever, the buds' moisture resistant materials won't play victim to your sweaty adventures. Connection-wise, Smokin Bud 2 has you covered; manage your device and your tunes with the in-line Mic1. Off-axis technology born out of the responsibility to make something that fits your oval ear canals. Off-axis technology provides an angled port into your ear, optimizing comfort, stability, acoustic performance and driver size; exactly like putting an oval peg into an oval hole. The oval port is shifted and angled just right to deliver superior fit, comfort and acoustic performance. Plus, moisture resistant materials won't play victim to your sweaty labors. You run the show. Manage your calls, playlists and your best friend Siri remotely using the single-button in-line mic + remote (Mic1). Answer the calls you want, end those you don't. Play your favorite song, pause it, or skip right through and be on to the next one. voice commands welcome, too. Let's face it: whether they look like Spock's or Will Smith's, ears are weird but completely necessary. Fortunately for you, the Smokin Bud 2 is unbiased. Aided by an off-axis (angled) design and oval-shaped port tested and researched to be perfect, Smokin Bud 2 has been cultivated for superior fit, comfort and acoustic performance. Skate with buds, go running, go skiing, whatever, the buds' moisture resistant materials won't play victim to your sweaty adventures. Connection-wise, Smokin Bud 2 has you covered; manage your device and your tunes with the in-line Mic1.